Thanks in part to feedback, I have updated my game. The following are some changes made to the game which are to be uploaded on the end of IGMC'18 (so far). Vegard starts with a standard weak chest armor, making him slightly less squishy in the first dungeon. Mundr's Pick up hammer is now unusable if he has the hammer. Party members now always starts battle with a full HP, making vigor more crucial. First boss given a massive boost. Now showing place names when entering all relevant locations. Place names were already existing, but never being shown. Fixed bug in Bifrost tower, allowing player to walk onto the top wall. Dialogue happen automatically when trying to cross a bridge which you are not allowed to cross yet. Decreased encounter rates in locations where enemies can appear. Added Mead efficiency and Avg. vigor to gold window in main menu. Added a new (currently empty) sub-menu to the main menu to be used for something currently not implemented. Mead efficiency drops twice as quick. Vigor also lost per battle attended at a starting value of 0.4% per battle fought, including steps party has taken. Fixed some typos, including the currency displayed by the inn maid when resting, as well as translated text going past the screen width. Changed the text with potions received in the beginning to 20 potions (20 were already given, just not shown in the message). - Add vigor effect for incoming attacks, not only outgoing. 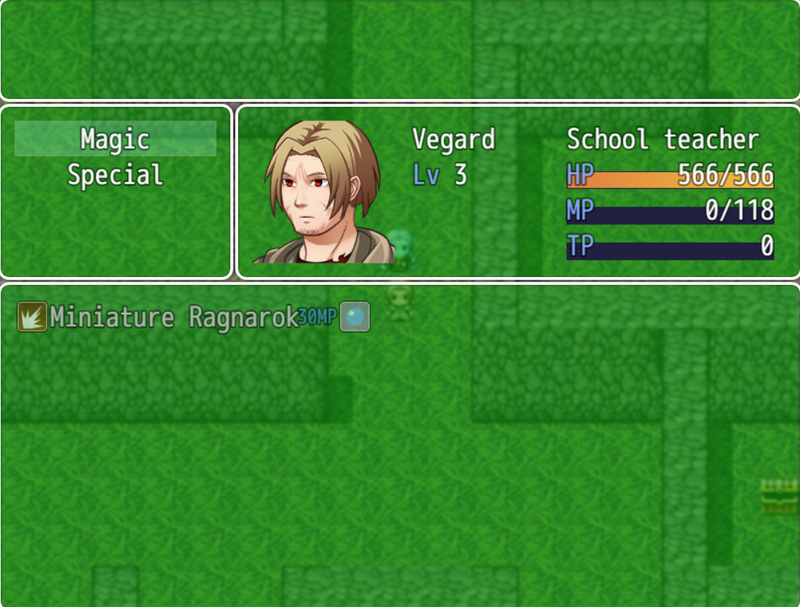 I have added a new subclass system where you can add 2 sub-classes per character. I have added a new menu item called Souls, to hold this. The sub-menu works quite well, correctly showing all stat changes when equipping/unequipping/changing a soul (read: class). 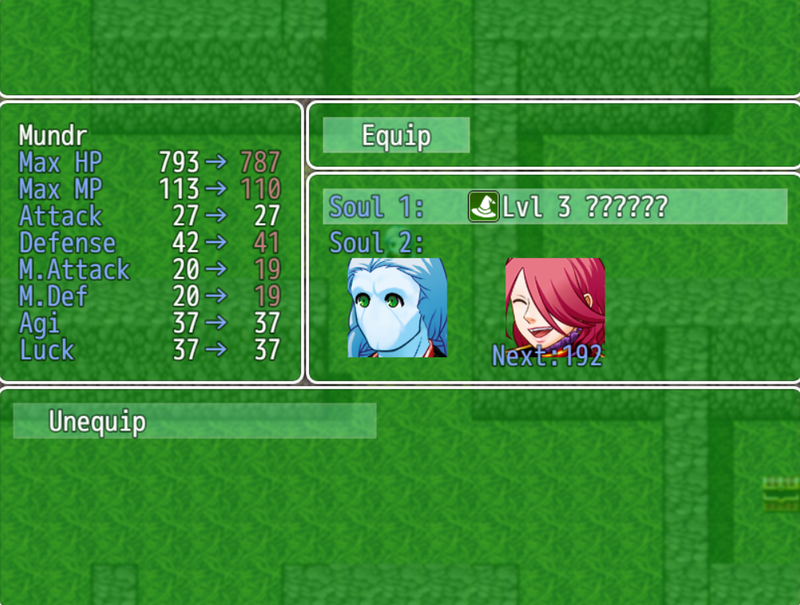 Each soul has their own, currently working leveling system in conjunction with the character's class. It has stats (hp, mp, atk, def, matk, mdef, agi, luck) that adds to the character when equipped, much like equipment. Each soul has it's own level and experience value, and as the level goes up, the stat increase of the item goes up (quite intuitively). Each soul also has a set of skills that it will learn as that soul gains a level. A character who has a soul equipped will learn the skills of the soul it has equipped. Note that a soul can freely be changed around as it keeps its level even when unequipped. Tiered skills. If a character equips a soul who has the same skill as that character already knows, either innately or from another soul, the already known skill is replaced by a new, stronger version of that skill. 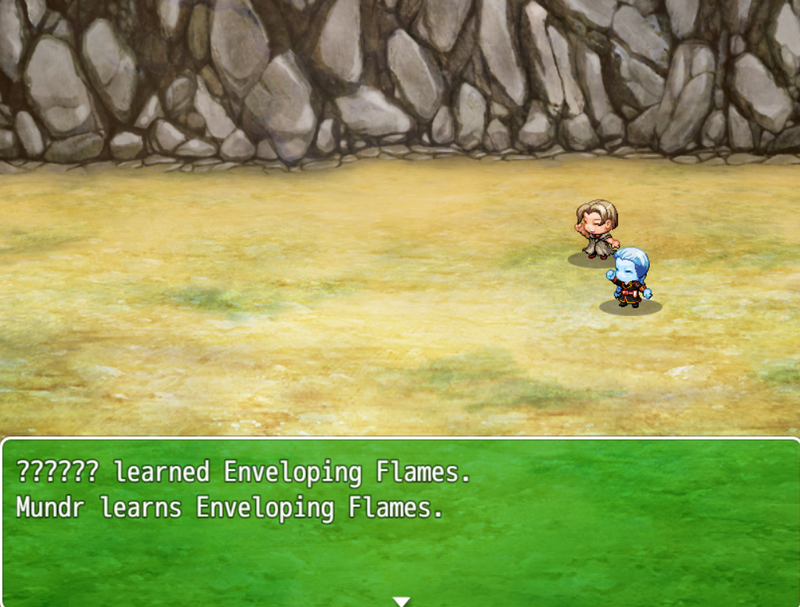 Similarly, if a character unequips a soul which has a skill, that skill is forgotten or downgraded. There are three tiers; a base one, a stronger one, and an ultimate one. One - add mechanism for gaining new souls. The blueprints for this is more or less clear, but unimplemented, and will largely be related to defeating enemies in a certain way. Two - add the souls themselves, one per defeatable enemy. The big part of work here is to balance the available skills and stats per soul. Three - add three tiers for every new skill. The skills already in the game per now have working tiered skills.